HTC is back, and it is back with a bang! It finally delivered the no-compromise flagship smartphone we've been hoping to see for the past two years. Not that the HTC One M8 and One M9 were disastrous. Quite the contrary – both were solid smartphones overall, but they were dragged down by a common weakness. As previous comparisons demonstrated, competing high-end phones ran circles around the M8 and M9's underwhelming cameras, especially in low light situations. The HTC 10, however, is unlike its predecessors. As you might have read in our HTC 10 review, its camera delivers terrific results, both during daytime and when light conditions are tricky. This should make today's camera comparison quite interesting, to say the least. HTC now has the opportunity to drop its underdog status and establish itself as a formidable force in the camera department. But first, it will have to endure a race against three very capable opponents, namely the iPhone 6s Plus, the Samsung Galaxy S7, and the LG G5. For today's camera comparison, we've chosen to do things differently. We'll focus solely on these four phones' low-light performance, as that seems like a great way for their cameras to show their potential. Any modern phone can take a decent photo given plentiful light. When light is scarce, however, it takes a quality camera to shoot an image worthy of admiration. Before we comment on any of the images we took last evening, let us take a look at what these four phones have to offer in terms of specs. Technically, the HTC 10 does not have the most megapixels at its disposal, but this isn't something you should care about anyway. What matters more is that it has the biggest sensor with the biggest pixels. In theory, this should translate to less digital noise and better light sensitivity. The Galaxy S7 stands out with the widest aperture among these four phones, and that is another factor affecting how much light a camera can pick up. Furthermore, we see that all four cameras take advantage of optical image stabilization, allowing them to shoot using longer exposure times, thus absorbing more light. All in all, the HTC does not bring a knife to a gun fight, but its opponents can surely stand their grounds. Let us now see how these four perform in real life. Note: the high-resolution images in the galleries below are smaller than the originals. We've scaled these down to make them load faster. If you insist on seeing the full-resolution photos and don't mind some of them being over 10MB in size, they're in a separate gallery found at the very end of the article. By the time we arrived downtown, the sun had already set. Street lamps were about to go off as the little remaining sunlight scattered across the sky was weakening by the minute. The moment seemed right to start shooting. Disappointingly, the HTC 10 couldn't quite handle this first scene well. Its photo lacks exposure, which gives it a gloomy, unnatural look. Besides, the colors are far from accurate, as evident by the purplish hue dominating the sky. The iPhone 6s Plus yielded a photo with better colors, but it could still use some more exposure. The Galaxy S7 got the colors right and exposed the scene enough to accentuate on the museum's façade, but left the shadows overly dark. 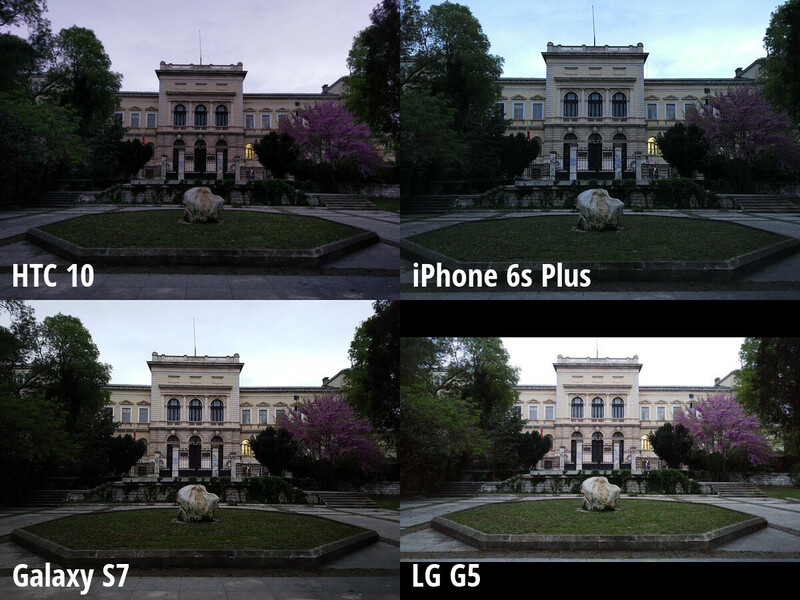 It looks like the best image overall was produced by the LG G5, which may have overexposed the sky, but has made everything else in the photo appear close to the way it did in real life. It was getting dark quickly, and the streets were starting to look bare. Lights of all kinds were already blending with the twilight when we snapped this set of shots. This particular scene was no challenge to the HTC 10, obviously, as it managed to capture a splendid image. Just look at the detail! Sure, the image is a bit grainy from up close due to the higher ISO setting, but we'd take some digital noise over smudged details any day. The iPhone's photo is also looking great. Detail in it isn't quite as sharp, but the image has an overall pleasing, natural look. It is only the Galaxy S7 that managed to mess up the colors by adding too much saturation and not hitting the right white balance. At least details look okay despite the rather aggressive sharpening. As for the LG G5, it is treating us to a very faithful reproduction of the scene – one rich detail and accurate in colors. It was a long day at the office, so we stopped at a favorite place of ours to chill out, and while doing that, we shot this set of images. Analyzing the HTC 10's photo confirms a pattern that we noticed – its camera is not afraid to shoot at high sensitivity levels. This explains the graininess seen in its image. But the good news is that the noise is tolerable – text on the labels, for instance, is still legible – and the high ISO value allows the HTC 10 to keep its shutter speed high, thus reducing the chance of motion blur spoiling the image. And overall, its image looks presentable. It is not the best in this set, but it looks decent nonetheless. The iPhone 6s Plus took a slightly darker, duller image, but we'd still rank it above average in quality. There's a good amount of detail preserved in it, if you take a closer look. But the photo from the Galaxy S7 definitely draws more attention. The phone drew in more light to produce a brighter, more vivid image. Same is the case with the LG G5, which captured fine details even better than the S7. Gotta be honest here, you cant really go wrong with any of these phones in the camera department. Yep. It's amazing how far these things have come. Espcially amazing how HTC has closed the huge gap which seperated them from Samsung in the photography side of smartphones. Really impressed! Would've loved to see Nexus 6P with the rest. I would like note 5 to be added to the mix, to see how previous generation Samsung hold their own against these new guys. Watch some more reviews will ya, like their own blind comparison or ANY other review. And DxOMark. That's too kind to HTC. They're still inferior. Anyways, I like how HTC stepped their game but isn't really 'amazing' to be honest. The S7 is "less noisy" because it applies a CRAZY amount of sharpening to the image - to the degree where it actually destroys image information. You're better off getting a photo with gentle noise and clearing it up with proper photo editing software at home if you really feel its necessary. You nobody does that. 99% of pictures taken are for social media and S7 makes them look good instantly and does it for you. That's why it's called a smart phone. I know some disagree but I use my phone as the family camera now. Having shared albums between family member, cloud syncing to pc and Apple TV/android box automatically, portability and 2 seconds from pulling it out of your pocket to taking a pic makes it so easy to enjoy photos. I still print out important pictures for albums though. When I sold phones my selling point was the fact that they're more than just a phone now. I'd even ask customers when was the last time they bought a wallet with a picture holder in it. You're right, but the differences can affect the opinion. There are many points that i can't agree with PA. In scene 4, S7 produced the best photo, sharpest and nice colour to me. 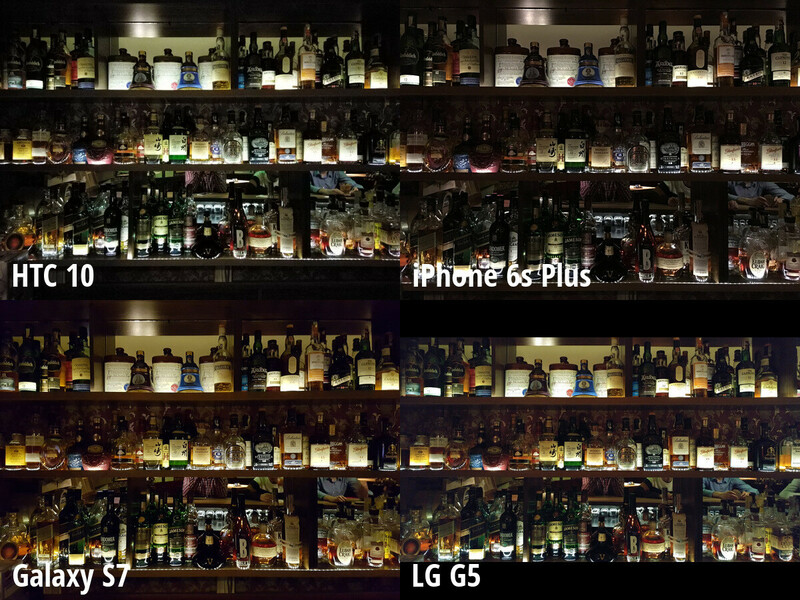 In scene 1, I prefer the balance of S7 than the overexposed G5. Well, personal preference i guess. I said scene 4 only, and I say the colour was nice, not natural. I think PA should give us the links to raw, sooc files so we can download, compare and see them all in one device, an FHD tablet or maybe a calibrated pc monitor. They won't, because then it would show the S7 is actually the best and they don't want that. iPhone Arena hates Samsung. Always has been that way. But like , S7 ALWAYS sharpest , most detailed pic and still low score , wtf ? I think people often confuse the sharpness of focus with excessive sharpening to the point where it looks unnatural. Some images here the S7 has a sharper focus (a good thing), but in others it goes further and applies an additional level of sharpening in post that look unnatural. Yes, also Samsung's colour-boosting algorithm. It makes the S7's photos look nicer, but it's fake and unnatural. There is actually no such term as "colour-boosting algorithm", you made that up. It's just saturation and vibrance. Okay... But still, you get my point. So when the G5 overexposed and captures an unrealistic scene at night it's a good thing, yet it doesn't work that way for Samsung? S7 colours are often more true to life than the G5. 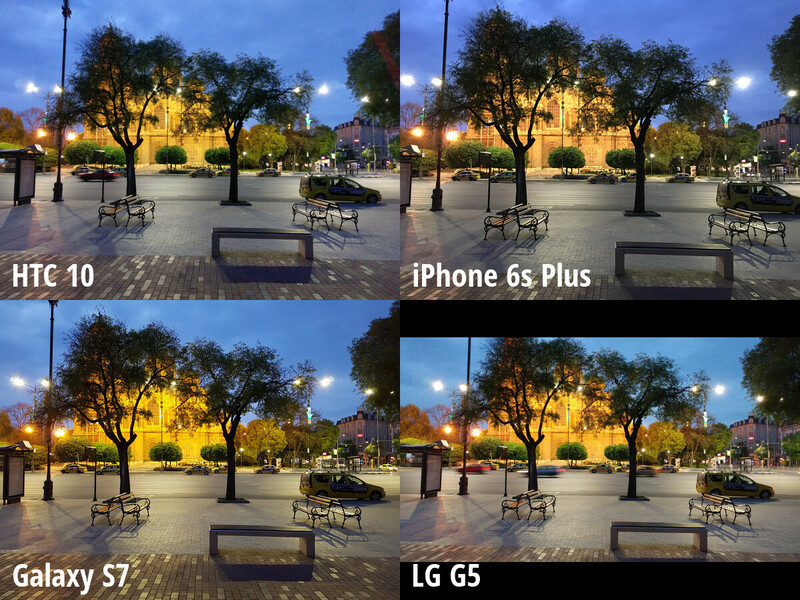 G5 colour sensor often incorrectly compensates. Sharpening cannot make the photo more detailed. Details don't lie, it's what the sensor capture.